In some cruel, cruel parallel universe where I were forced to choose between cookies and cakes, cake would never win, even if topped with the most perfect plop of pink butter cream frosting (because pink tastes better, oh yes, it does) and brightly-colored confetti sprinkles. I don’t mean to diss on cake. I’ve had some good cakey creations in my time here, but even the most spectacular rum-doused pineapple upside down cake or flourless chocolate creation feels at times an uphill battle with the fact that cake, deep down inside, wishes to remain dry. Cookies, on the other hand, desire balance – crisp exteriors, supple interiors, and each and every one of their ingredients gets to make a full-on appearance in the final flavor. As an added bonus, they keep for a week. Thank goodness I’ve never been forced to make such tyrannical decisions, but were I, I think I’d start with some of the creations in last night’s Chez Smitten Cookie Fest 2006, in which I tried to bake as many oversized cookies as a could in one night, to be assembled tonight into ice cream sandwiches for friend’s surprise party. First into the mixer were these gigantic chocolate chip cookies. Like most people, I already have a favorite recipe. Mine is buttery and compact and has a high chip to dough ratio. But, they’re not much in the way of spreaders, and this one better fit the bill. Second in line were, I’ve got to say, one of the easiest, tastiest chocolate sugar cookies I’ve yet to come across. Ingredients are assembled, one-bowl style, in a food processor in no more than four minutes, and baked in another nine. They come for a recipe for Oreos which I highly recommend, but even alone they will leave you wanting for nothing but a glass of milk. As the clock ticked ten p.m. I fiercely debated with myself whether or not I was insane enough to throw down a third batch for the blasphemous non-chocolate eating types, and like all debates with myself about my potential for insanity, I came out crazy. I found this recipe on Flickr, via this gorgeous picture, and after seeing that the recipe source was Cooks Illustrated, I felt fully confident giving it a whirl. Despite the amount of spice in there, the flavor is anything but overwhelming, and they’re so moist and crumbly, they might convert my cookie tastes yet away from chocolate-laden cookies. Might, I said. Let’s not get carried away. Preheat the oven to 325°F (165°C). Grease cookie sheets or line with parchment paper. Sift together the flour, baking soda and salt; set aside. In a medium bowl, cream together the melted butter, brown sugar and white sugar until well blended. Beat in the vanilla, egg, and egg yolk until light and creamy. Mix in the sifted ingredients until just blended. Stir in the chocolate chips by hand using a wooden spoon. Drop cookie dough 1/4 cup (for a ridiculously large cookie, one or two tablespoons for more standard-sized cookies) at a time onto the prepared cookie sheets. Cookies should be about 3 inches apart. Bake for 15 to 17 minutes (closer to 12 minutes for non-1/4 cup scoop cookies) in the preheated oven, or until the edges are lightly toasted. Cool on baking sheets for a few minutes before transferring to wire racks to cool completely. Set two racks in the middle of the oven. Preheat to 375°F. In a food processor, or bowl of an electric mixer, thoroughly mix the flour, cocoa, baking soda and powder, salt, and sugar. While pulsing, or on low speed, add the butter, and then the egg. Continue processing or mixing until dough comes together in a mass. Take rounded teaspoons of batter [For oversized ones, I used a 1/8 cup scoop] and place on a parchment paper-lined baking sheet approximately 2 inches apart. With moistened hands, slightly flatten the dough. Bake for 9 minutes, rotating once for even baking. Set baking sheets on a rack to cool. Adjust racks to upper- and lower-middle position and heat oven to 375 degrees. Whisk flour, baking soda, salt, and spices together in medium bowl; set aside. Either by hand or with electric mixer, cream butter, brown sugar, and 1/2 cup granulated sugar until light and fluffy, about 3 minutes on medium speed. Scrape sides of bowl with rubber spatula. Add egg, vanilla extract, and molasses. Beat until combined, about 30 seconds. Scrape sides of bowl. Add dry ingredients and beat at low speed until just combined, about 30 seconds. Place remaining 1/3 cup granulated sugar in shallow bowl. Working with 2 tablespoons of dough each time, roll dough into 1 3/4-inch balls. Rolls balls in sugar and place them on ungreased baking sheets, spacing them 1 1/2 to 2 inches apart. Bake, reversing position of cookie sheets (from top to bottom and front to back) halfway through baking, until outer edges begin to set and centers are soft and puffy, 11 to 13 minutes. Cool cookies on sheets for 2 to 3 minutes before transferring to cooling racks with wide spatula. Hello, thanks for visiting my site, because it has directed me to your lovely blog. This post got my attention of course because they were cookies. What a gorgeous spread of various cookies, I love that yours are big, flat and perfectly rounded. I am definitely giving that molasses one a go. Deb, I am so excited! I just commented the other day on your other blog (about these cookies, I believe) about how I thought you weren’t cooking anymore, and then I happened upon this site. Best of luck to you! Wow. I came here via cupcakeblog.com and I love your food photos. Great combination of depth of field, vibrant colors, and wonderful subjects. For the record, cookies would win with me too. I’m just a cookiephile. I’ve been reading you a while and have bookmarked so many of your recipes to try. After I finished eating a totally uninspired and frankly tasteless dinner, I decided I had to have something sweet to make me feel better. 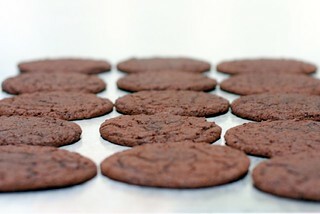 I’ve just finished baking the Chocolate Sugar Cookies and they are FANTASTIC. I’ve lost count of how many I’ve eaten! Thank you for this and sorry this comment is so late. Just found your chocolate sugar cookies and am in desparate need of baking up a batch! My son is going to LOVE these cookies too! I have just been turned on to this site of yours and am in heaven. Anyone who defines cookies as you do rates high with Moi. Cookies, choc-chip being #1, is on the apex of my own personal food pyramid! I (and my cookie fans) thought I made the very best, but I am going to give yours a try. If yours are better than mine, I will applaud you 9and eat half a dozen of them in your honor). I am looking to top my last years ‘Christmas cookie swap’ winner and these may be them. I contend crime would drop dramatically if the criminals would just sit down with a glass of milk & some home-made cookies before going out to do their crime. I just think they’d change their minds! Whose to say – cookies could be the answer to the problems of the world! They sure help me when I’m in a funk. Carry on, oh, great cookie makers, and spread world peace through your cookies! the Big, FAt, Chewy Chocolate chip recipe. Nothing compares to it! I just discovered your website by accident. I must say I love what I read and the photos are great, not to mention the recipes as an added bonus. As an avid cook, I believe this website to be refreshing. sorry, i may have missed it, but how many cookies does the chocolate sugar cookie recipe make? i just made the molasses cookies- forgot the cinnamon (swore i forgot something before i put them in the oven, in my haste to keep a tidy kitchen). before the last 9 went in i had a moment of premenstrual cravings epiphany and chopped up half an extra extra dark chocolate Dagoba chocolate bar and tossed in some white chocolate chips… who says you can’t have your spicy gingery molasses cookies and your chocolate too? thanks for making my home smell like heaven. I just made the chocolate sugar cookies to take to a bar mitzvah and they were *so good*. I added some vanilla and they were absolutely heavenly. For Lena, it’s months later so this ls probably useless information but I found the recipe made about 3 dozen cookies though if I were using them for ice cream sandwiches I’d make them a little larger and thus get a lower yield. Deb–thanks for the recipe–this is a keeper for sure! Made the chocolate sugar cookies today! They are SOOO DELICIOUS. Thank you for sharing this fantastic recipe! I often make this recipe for chocolate chip cookies and to make a fat, chewy cookie by preventing spreading, simply raise the temperature to 375. I still bake them for around 17 minutes and they turn out perfectly. I had the same problem as bella when making the chocolate chip cookies. They didn’t spread or flatten! I wonder what I did wrong? I made the chocolate chip cookies and they flattened gorgeously. They were yummy and moist yet crisp. I thought the tablespoon of vanilla was an error, but they came out wonderfully. P.S. — I used Hershey’s dark chocolate cocoa, too. The cookies turned out more black in color than yours look in the photo, and the flavor is a little different than your typical cocoa flavor I think. I think once I get the bottoms coated in ganache these will be a really rich treat. One last note: I realized my ganache was too soft to be a bottom, so I ended up sandwiching the cookies anyhow. I’ve stored them in the fridge, but when I brought some to work to share with others, I realized that room-temperature makes the ganache soft and it combines with a softer cookie somehow and it’s like the best thing I’ve ever eaten. I have plans to make mini versions of the cookies with different kinds of ganache–chocolate mint, white chocolate peppermint, etc.–to take to some large family food gatherings. Any chance there will ever be an option to edit comments we make? That way I don’t have to post multiple ones as I discover new things about the recipe over the days it takes to prepare, cook, and eat the leftovers of something you make. If you’re interested to hear it that is! If not let me know to stop bugging you (if I am, sorry!). I made the Oreo’s last week, and despite some difficulties they turned out awesome. [Although too sweet for my taste, which is why I intend to do them filling-less-ly..]. I just have 1 question; Should the butter need to be in a liquid form? Or solid? Like, do i have to pop it in the microwave for a few seconds..? It makes more sense to me that way, but I’m not sure..
Deb, I just wanted you to know that I LOVE your site! I found it through a friend who made the Petit Four cake about 5 months ago and you’ve been on my “Must Check Daily” website list ever since! I made the Molasses-Spice cookies last night for a party and they were a HIT. Everyone loved them so much there weren’t any left for my husband, so I had to make him another batch- haha! I say that to say… I’ve never thought I was ‘that good’ of a cook, but you’ve made me more confidant in my culinary endeavors. Thank you for doing what you do. 3. and then roll them in granulated sugar! Wowza – I think I may have found my new favorite chocolate chip cookie recipe. Oh wow – it’s SO good. I have just made the chocolate chip cookies. They didn’t come out flat either, but still delicious! At first I used a 1/8 cup, but since the cookie didn’t flatten, they just were regular sized. I used a 1/4 cup to achieve the size I wanted. @ Noam, I microwaved the butter for 30 seconds and just stirred it until most of it was melted. It was so much easier to mix with the sugars that way. I just made these and they are delicious! I even tried a few with chocolate chips (what isnt better with choc! ), but the chocolate distracted the other flavors. Simply delicious! Thanks! 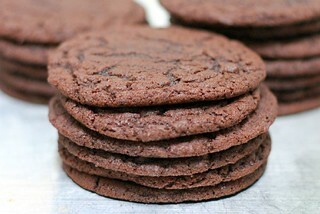 The chocolate sugar cookies = ADDICTING! For those asking about yield, I got about a dozen large cookies. I just love your cookie recipes! I think of them as fail-proof hits. 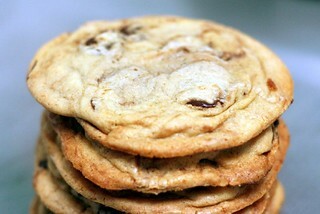 I’m making these chocolate chip cookies for ice cream sandwiches for our 4th of July party this weekend. How much ice cream would you recommend for each sandwich? It will depend on the size of your cookie, but I usually say less is more. I hate a sandwich I can’t bite into. I can’t imagine needing more than 1/2 a cup per. I can’t wait to make these! Was looking on the site today for an easy and fun dessert idea for a girls get-together. I think I’m going to put banana ice cream between the chocolate sugar cookies. Thanks again for yet another awesome idea! So excited to make the chocolate sugar cookie ice cream sandwiches. I was just wondering, what is the best material to use to wrap them and freeze them (seran wrap, parchment paper) and how long will they stay good in the freezer? Thanks! Wow, your ice cream sandwich cookies look aaaaaamzing!! Can’t wait to make them! I just made ice cream sandwiches last night with the chocolate sugar cookie recipe. They were soo good! and possibly the easiest cookies I have ever made.They really made the ice cream sandwich. The leftover cookies are great on their own too. had a craving for cookies but didnt have chips, so a chocolate sugar cookie sounded perfect! i used what i had handy and had to make some substitutes in the recipe, Hershey’s cocoa powder and raw sugar. the dough mixed to the consistency of coarse beach sand, and i was skeptical as i formed the small balls of dough… but 9 minutes later these cookies were quite satisfying. in fact i think even better! a cookie like no other. thanks for the ideas and inspiration! I just made the Molasses cookies. Oh MY Goodness! They are so gorgeous. (I honestly felt like a professional cookie chef when I pulled these beauties out of the oven) But the best part is they taste even BETTER than they look. I want wrap them up with pretty bows and give them away as little Holiday treats. They are so delicious and perfect. Thanks for sharing such a lovely recipe. 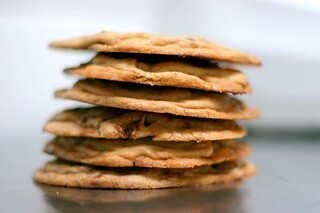 I made your cookies and they made it onto nytimes.com! they’re the “also pictured” cookies in my cranberry orange pinwheels entry. whole wheat flour– healthier and seems to work fine. handheld beater in a large mixing bowl– messy but still worked. was skeptical of the grainy texture of the dough but just smush it into the teaspoon a little and it works well, made about 60 3/2 in-diameter cookies. How eerie – to be commenting right after another Danica! What are the chances?! The Chocolate Sugar Cookies came out great. I used about a little less sugar because I figured they would be plenty sweet when sandwiched with ice cream. I also added a touch more cocoa powder just because. They’re delicious and so tasty with mint/chip ice cream. 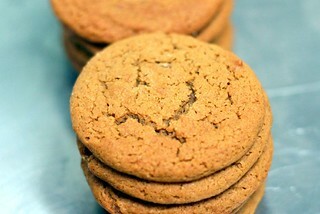 The Molasses Spice cookies are very yummy and I love that they’re still a bit chewy. Can’t wait to make them again in the fall, with pumpkin ice cream for the sandwiches! I just made the chocolate chip cookies, and YES! These are perfect for icecream sammiches! (I made Tyler Florence’s basic vanilla, cooked/frozen custard). For those that have trouble with puffy cookies, instead of flat crispy-edged-but-still-chewey cookies — check your oven temperature with one of those in-the-oven thermometers. What happens is that before the butter can completely melt (and make the cookie spread) the rise of the cookie and egg “get set” and make the puffy stay. The trick is the lower oven temp here — melts the butter to spread BEFORE the rise/egg bake. Also — be sure you are thoroughly creaming your butter with the sugar – the sugar should be dissolved. I use a finer “baker’s sugar” for cookies and cakes b/c it will dissolve sooner. I also just got a Kitchen Aid mixer which helps of course. Hi Deb! I recently found your website and tried your recipe for chocolate sugar cookies this morning. They came out fantastic! For those asking about yield, the recipe produced about two dozen good-sized cookies for me. They spread quite a bit while baking, so there’s no need to make them too big! We also used one extra egg because our dough was too dry. They’re cooling right now, and I can’t wait to taste them. They’re perfect for the ice cream sandwiches I’m making this weekend! Thank you so much for the recipe, and I will definitely be using this site again! I found your website last month while looking for cake recipes. Since then I have made the lemon layer cake, brandied ganache layer cake, black and white cookies, and tonight, the big fat chewy chocolate chip cookies. Every recipe has been a huge hit. I think my health and weight conscious husband is on the verge of hiding my kitchen-aid. I tried the molasses cookies twice in a row and they come out as puff balls. No spread at all, and very dry. What could I be doing wrong?? I found your “Big, Fat, Chewy Chocolate Chip Cookie” recipe the other day and had to try it. I have to say they were great. Next, I think I’ll try the molasses. Hope I don’t run into the same problem as some of the others. Thanks again for the great recipes. How do you make the chocolate chip cookies flat like the picture, but still have it crunchy on the outside and chewy on the inside? For example, the crispy chewy chocolate chip and the ice cream sandwich chocolate chip have the same exact ingredients and procedures, but they look different (according to the pictures). The ones up top are enormous. The crispy chewy ones are tiny, didn’t have as much time to spread out. If you want to encourage spreading, you can butter your baking sheets. Just wanted to ask – (with regards to the ice cream sandwich cookie..because it’s super delish) If one we were to make a huge chocolate chip cookie (sort of the size of a plate maybe? Worst dimension comparison ever), like for a birthday party type thing… how does one keep it still thick and chewy/how big should the ball of cookie dough be? Or should I opt for a different choc chip cookie recipe? We are opening an artisanal ice cream shop in Portland Oregon in June and, while our ice cream is amazing, we’re still working on some of the mix-ins and accompaniments (we try to make every thing in house). In search of the perfect ice cream sandwich cookie I came across your recipe. This will now be the second time you have helped me out (yay marshmallows!). The cookies just came out of the oven and they taste, look and smell amazing. I scooped some of our mint chocolate chunk ice cream on to a pair of cookies and put the sandwich in the freezer to await our test crew’s opinion (read: our children coming home from school). I love your site! If you are ever traveling to Portland, please look me up. I’d love to treat you to some ice cream! Jodie — You should try these too! Not that you asked, but my homemade ice cream sandwich pet peeve is cookies that freeze so hard that they are impossible to bite into. In the not-so-hard camp, I’d put the molasses, chocolate cookies here and the ones I just linked. Good luck! I made the chocolate chip cookies three times, and they were amazing. Finally I could satisfy my craving for a crispy and chewy cookie. Mine surprisingly did come out flat, but not as flat as yours. I’m going to bake the Molasses ones today. I was going to buy a similar cookie at a chain bakery, but I thought making my own would be less expensive…buy boy, was I in shock at the regular price of a small container of ground cloves (over $9)! Fortunately the spices and the vanilla extract were on sale this week at supermarket. I also got a “pint” of Haagen Dazs newest pumpkin ice cream so I definitely want to make ice cream sandwiches! I needed a vanilla flavored cookie for ice cream sandwiches, so I took the chocolate recipe and replaced the 1/2 cup cocoa powder with regular flour and the white sugar with brown. I also added a tsp of vanilla. The cookie is delicious, kind of like the base for a chocolate chip cookie, but thin and crispy/chewy. Hi Deb. A friend (Curries and Cakes at blogspot) and I were making the spice cookies and they are delish! The only thing is that they did stick to the cookie sheets, so I would recommend still greasing the pan…it might have had something to do with the fact that I used GF flour (this also reduces the baking time to 8-10min). Thanks so much!! The molasses cookies are delicious, but mine didn’t turn out as flat as the ones in the photo. The thicker cookies were difficult to make ice cream sandwiches with. I made the Big, Fat, Chewy Chocolate Chip Cookies. They were chewy and perfect out of the oven. Hours later my husband tasted them and told me they were hard. I was so happy when I made the perfect cookies but now I have to microwave them to make them soft again. Anyone ideas why?? I would bake them a couple minutes less next time. The chewiest cookies will look a tad underbaked when you pull them from the oven. Just made the Chocolate Sugar cookies. YUMMY!!! I used a cookie scooper and then rolled just the top in sugar before flattening a bit. Perfect!! On to the next recipe on this awesome website!! Hi deb. I’m a regular follower of yours and have tried a gazillion of your recipes! You are by far my go to blog for baking needs. I am having a milk and cookies party for my one year old and I’d like to make a gigantic ice cream cookie cake. Would these recipes work on a large scale to make like a 10-12″ cookie and then freeze well but not rock hard? I want to sandwich them with ice cream like a gigantic ice cream sandwich (then slice to serve) but perhaps my dream is too grand? :). I’m also going to be using 5 of your recipes for our dessert table. Haha. I should send you a picture to promote your recipes. Thanks for everything! Any advice would be appreciated! LOVE the molasses! I made them tiny. So good! Thank you! I made the chocolate chip, and mine, too, were puffy, but I’m too busy enjoying the taste and texture to worry about what they look like. To die for. I made the chocolate chip recipe last night for cookie ice cream sandwiches. Alas, they didn’t spread much at all. They made a thick and very satifsying cookie. For once, one cookie is almost too much cookie to eat in one sitting! I recently bought an ice cream maker and made the most amazing vanilla ice cream. I wanted to make ice cream sandwiches, but I needed the right cookie recipe: substantial enough to hold up to the ice cream, but not so firm that the ice cream just squeezes out the back of the sandwich before your teeth even get through the cookie. So I Googled “ice cream sandwich cookie recipe” and found this page. I made the chocolate chip cookies this afternoon, assembled the sandwiches once they cooled, and put them in the freezer for a couple of hours. They were perfect! Thank you so much for this recipe. Seems like you’ve been fighting ads lately, sorry to pile on but Hellmann’s ads are taking over full page for me. I’ll still be making the chocolate cookies, again! I should really copy down the recipe, eh? Aloha! I am having the same issue as other posters, i tried the chocolate chip cookie recipe and they did not come out flat like yours… I used mini chocolate chips instead of regular ones, will that make a difference? this is my first time trying this recipe and all of your cookie recipe have been tried and true with results as expected. is it possibly the altitude or the size of the chocolate chips? can anyone share how many cookies the chocolate chip recipe and chocolate sugar recipe yield respectively? trying to make these for an ice cream party and would love to know how i need to scale this recipe :). thanks in advance! Tried the Chocolate Chip cookies for the second time and just as good as the first batch! Love it. Thanks for the recipe. I just made the chocolate chip cookies and the chocolate sugar ones. The chocolate chip were delicious but did not spread. Next time I will try flattening them a bit before baking. The chocolate sugar ones came out flat, but I followed the directions and flattened those prior to baking. Wished I had sprinkled sugar on the top, forgot to do that. Each recipe made 3.5 dozen cookies when using 1 tbsp as the measurement, so on the smaller size. The “why aren’t my cookies flat?” query continues. More people struggle with this than any other cookie issue. Oven temp, as many commenters noted, is definitely a key variable- if your oven temp is too high, the cookies will leaven and set before they have a chance to spread. Buy an oven thermometer at the hardware store and check your oven temp. A paragraph in Flo Braker’s incomparable book, Sweet Miniatures, discloses something sooo important. She describes an experience which taught her an important lesson in cookie shape, height, and texture. When making chocolate chip cookies one day, she began to cream the butter and sugar as usual- and left the mixer running as she went to answer the phone. Returning five minutes later, she found the mixture to be pale and fluffy. And for the first time ever, her tried and true chocolate chippers were rounded and dome like– instead of crisp, chewy, and considerably flatter. The more you cream, the fluffier the end result will be. Just another one of the many “spread” variables !! Molasses again. LOVE them. We make them really small, so you can just pop them in. YUM! How many cookies does this recipe make? I have to make at least 22 for a party. These cookies are delightful to make and bake. The house smells wonderful and as soon as my grandchildren walk into the house, they begin eating the cookies and do not stop until they are all gone. Another wonderful success story for one of your recipes. Thank you for sharing. Hi – I am concerned about the order of ingredients for the choc sugar cookies. Never saw a recipe before that had the butter and sugar separate like these. Usually I cream butter and sugar and then add other wet ingredients and then dry. This recipe is backwards. CC — It is not the usual way, but it works perfectly here. Promise. For the molasses cookies, does the dough freeze well? I’d like to make the dough ahead of time and pull out last-minute to bake but I don’t want to find out the hard way that it’s not a good recipe for that. Thanks! Kelli — Yes, it does. And, almost 10 years later, I just made the molasses cookies to scratch a want-to-bake-something itch, and they are lovely! Hello! We made the awesome chocolate chip recipe above and I was wondering if you can assemble the sandwiches ahead of time? Maybe two to three days and then freeze them? Any thoughts? Thanks for the great recipes! Absolutely and it’s for the best because the ice cream softens when you assemble it so it’s best to give it more time to chill. I used your brown butter coconut cookies to make ice cream sandwiches. Delicious! This webpage with the video ads won’t allow me to read the article, it just keeps jumping around. ARGH!! !